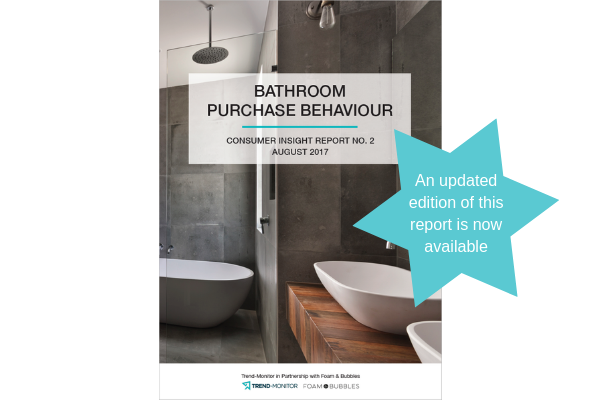 This bathroom industry report investigates the purchase of a new complete bathroom and the key influences on consumers as they progress through the purchase process, such as budget, family circumstances, brand awareness, research methods and advice sources. The report reveals how consumers choose their suppliers, how they plan and design their new bathroom and how they find a bathroom fitter. The report has had the benefit of a 1285-strong respondent base which was accessed via a collaboration with the online bathroom inspiration platform Foam & Bubbles. The respondents, all UK consumer-homeowners, have all recently fitted a complete new bathroom, or are actively planning a complete new bathroom for installation in the near future, resulting in a highly-engaged survey audience. “Direct access to people who are actively engaged in the purchase of a new bathroom has enabled Trend-Monitor to obtain high-level insights into the purchase process. The result is an invaluable resource for bathroom brands, bathroom retailers and industry professionals, providing a focus and structure for new product development and customer engagement programmes”. “This report will allow bathroom brands and other interested parties to have a deeper and more insightful knowledge of the bathroom purchase and replacement processes, outlining motivations and demographic patterns, with the result that we will have a deeper understanding of the way consumers refurbish their bathrooms today – and in the future”. Brand awareness within the bathroom market remains low, clearly illustrated by the 90% of survey respondents who were unable to name any of the brands they had used or were planning to use in their new bathroom. Brand awareness does however increase slightly as the bathroom budget increases to the point where more research is done online, and more purchases are made via local bathroom showrooms instead of DIY and retail chains. Research prior to purchase continues to move online over the past year with 45% more people researching via online bathroom inspiration websites, in particular for the higher-budget bathrooms. 46% more people are researching via e-commerce websites and these tend to be focused on the lower-budget bathrooms. The design services offered by bathroom retailers and installers have a relatively low uptake with a third of homeowners choosing to plan their new bathroom themselves and a further 29% of new bathrooms keeping the same layout as before. Interestingly 24% of those homeowners who plan their own bathroom choose to do so on paper, compared to only 10% who use an online design tool. Water saving features have recently increased in importance within the bathroom purchase process. This is shown by people currently in the planning stage of their bathroom installation being twice as likely to consider water-saving features to be important when purchasing a bathroom product than those who have already installed their bathroom. The influence of the bathroom fitter on the modern-day bathroom is evident throughout the whole bathroom installation process, however consumers sourcing a bathroom fitter for their new bathroom are still doing it the traditional way – by personal recommendation. Bathroom fitters are over twice as likely to be appointed based on a recommendation from a family member or friend than any other sourcing method.